Day one of the Greenhouse Open event in San Francisco was chock-full of great recruiting tips and takeaways. But what made me jump out of bed at 3:30 am this morning, was something during an awesome presentation by Jan Fiegel, Head of Recruiting at Oscar Insurance. Jan was presenting the importance of structured job interviews. 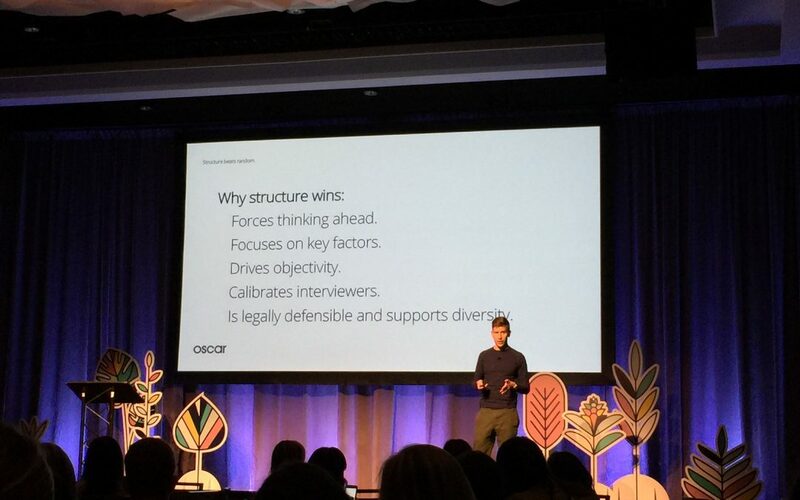 He talked about how structured interviews help us think ahead, focus on key factors, drive objectivity, help legal defensibility and improve diversity. But the word that Jan said, now stuck in my head, was “calibration”. .. That for any given requisition, after the first interview, it’s very hard to know how good the candidate was based on their answers. Jan says that only after interviewing multiple candidates, do you finally begin to understand how answers compare and how a single candidate stacks up against the competition. While this makes sense, this is in direct conflict with our traditional phone screen process. With a heavy and complicated req load, it may be weeks before a Recruiter speaks with enough candidates for a given requisition, to have a thorough understanding of good vs. great answers and how to stack rank candidates. Because the interview took place over the phone (an off-line experience), all we have are the frantically scribbled notes from our call. The ability to reference a candidate’s actual answers from days or weeks ago, is lost forever. Even worse is that all we’ve learned from subsequent phone interviews, cannot be used to inform decisions about the initial candidates we spoke with. Professor Don Moore of UC Berkeley Haas, an advisor to Honeit, has extensively studied bias in the interview process and his research also concludes that without a structured interview process, predicting success on the job is merely a flip of the coin. With Don’s guidance, structured interviews are near and dear to what we’re building at Honeit and fully baked into our phone interview software. In addition to providing Recruiters with structured interview scripts to choose from, our platform lets Recruiters easily record a candidate’s phone interview answers in real-time, to never forget a detail and analyze the results. Recruiting teams easily review audio highlights from the conversations – days, weeks, even months later, for training and collaboration. Recruiters can now quantitatively analyze how top performers in their company answered specific phone interview questions. The ability to calibrate, by analyzing ‘great answers’, now begins before we pick up the phone. Phone Interview calibration is not only the ability for Recruiters to begin to understand good vs. great answers to highly technical or specialized skill sets. By sharing our work with hiring managers, we can quickly adjust and calibrate the specific phone interview questions we ask. Interview scripts can now be refined in real-time to help Recruiters hone-in, dig deeper and hire faster. Prior to co-founding Honeit, Nick was the Director of Global Recruiting at TubeMogul ($TUBE) and the Director of Strategic Staffing at MTV Networks (Viacom) in New York City, overseeing Global Digital Media and Interactive Technology recruitment. He has worked for two HR technology companies (Taleo, NextSource) and began his career as a technology headhunter. Nick received his MBA from the UC Berkeley Haas School of Business, and a BS degree in Applied Mathematics. Bring your candidate phone screens to the 21st Century with HONEiT Phone Interview Software. We make it easy to schedule, screen and submit candidates to Hiring Managers, to make better hires, faster. By sharing rich candidate data and live interview insights, we remove misinterpretation and bias and improve the interview experience for everyone involved. Start Your Free Trial today!